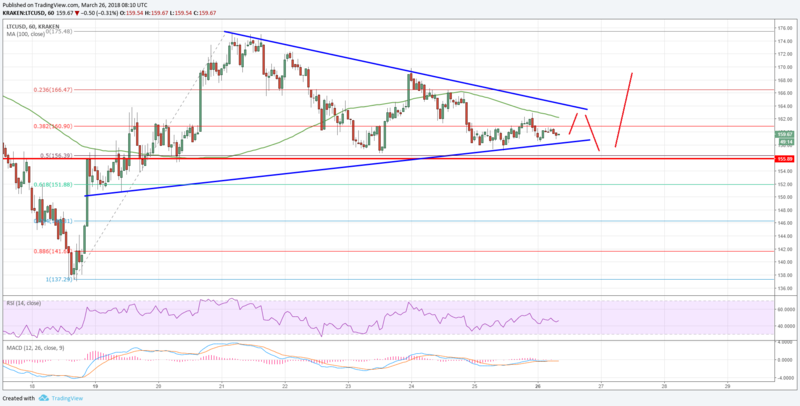 Litecoin price has moved above the $150 support area against the US Dollar. LTC/USD may soon make the next move either above $165 or below $155. Litecoin price is holding the $155-150 support area nicely (Data feed of Kraken) against the US Dollar. There is a key contracting triangle forming with current resistance at $164 on the hourly chart of the LTC/USD pair. The pair must stay above the $155 support level to avoid any further declines in the near term. There was a decent upside recovery above the $150 level in litecoin price against the US dollar. The LTC/USD pair traded higher and even tested the $175 resistance before starting a downside correction. There was a downside push and the price moved below the 23.6% Fib retracement level of the upside wave from the $137 swing low to $175 swing high. The decline was such that the price moved below the $165 support. More importantly, the price traded below the $160 level and the 100 hourly simple moving average. However, the downside move was protected by the $155-156 support area. Furthermore, the 50% Fib retracement level of the upside wave from the $137 swing low to $175 swing high also acted as a support. There was a strong buying interest near the $155 level and the price held the ground. On the upside, the $162 level and the 100 hourly SMA is currently acting as a resistance. There is also a key contracting triangle forming with current resistance at $164 on the hourly chart of the LTC/USD pair. Therefore, a break above the $164 and $165 resistance levels is needed for buyers to move the price in the bullish zone. Above $165, the price may retest the $175 level. On the downside, the triangle support and the $155 level are major supports. As long as the price is above the $155 support, it remains in a positive zone for more gains.